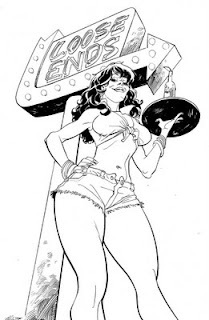 This week on Comic Twart Declan chose "LOOSE ENDS" a creator owned crime comic by my friend Jason Latour, and his insanely talented pals Chris Brunner and Rico Renzi. You should look for the comic at your local comic shop. I believe creator owned comics drive the industry with new ideas, and if you care about comics you gotta support them. More info about LOOSE ENDS here. Boy, this subject is right in your wheel house. Love the perspective though. Do you use any perspective grids to help line up your shots and backgrounds? This might be a future "process piece" post. Thanks, man! Here I just eyeballed it. I normally sit there and figure out the perspective vanishing points and grid it all out. Ordway was telling me about these old Grid books they used to sell, and I WISH I could get my hands on one! Would make life much easier. I can pretty much eye ball multi-point perspective now from having done it the oldschool way for so long. I've found some grids online I'd like to try out, but they're kinda limiting. A little like using Sketchup.